Anyone that has been to gym has probably seen someone guzzling down a protein shake. Made from protein power, these shakes are often thought as simply being a nutritional supplement used by body builders to help build muscle mass, but they offer a lot more than just this. Yes, protein powder helps the body muscles develop and recover so are very popular with people that hit the weights, but it also has various other benefits that others will appreciate. In fact, anyone that regularly exercises could benefit from protein powder. Protein powder is a nutritional supplement available in a few forms, namely whey, casein, and soy. Whey protein is the most popular type of protein powder, deriving from cow’s milk. It’s a water-soluble protein, contains complete proteins, and is quickly absorbed by the body, making it very popular amongst athletes and body builders. Casein protein is also made from cow’s milk but isn’t quite as popular as whey. Unlike whey protein, it’s absorbed slowly by the body, so is best taken in the evening to be absorbed overnight. It has high amounts of the amino acid glutamine, making it very effective for muscle recovery. Soy protein is made from soy and contains essential amino acids found in whey and casein, making it a popular option for those that don’t consume dairy. As whey protein powder is the most widely used most of the benefits included here come from that type of protein powder. Many benefits are gained from other types, but whey happens to be the most understood and studied, so the benefits are clearer. 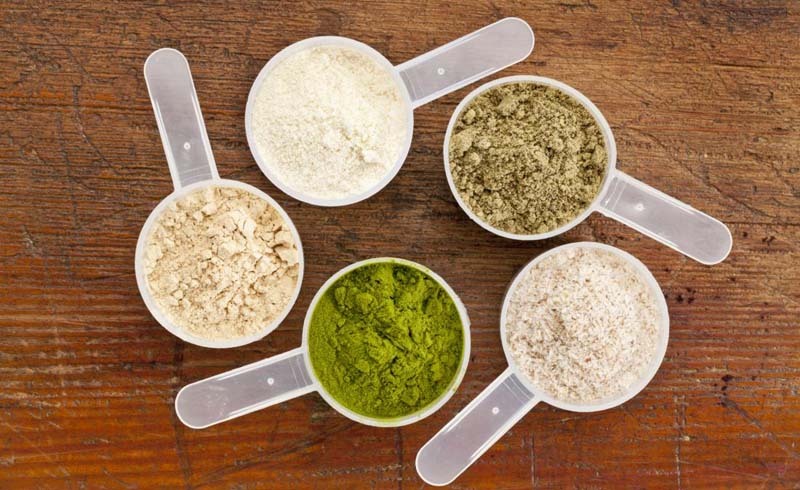 Let’s get the obvious benefit covered first – protein powders offer a source of high-quality protein for the body. This means it contains all essential amino acids the body needs to be healthy, with protein being used to build and recover many parts of the body, including muscle, skin, hair, and much more. Although you can gain protein through diet, not everyone manages this, while the quality of the protein may not be as high compared to a protein powder. Plus, because whey protein powder is absorbed very quickly, it means the health benefits are gained much quicker compared to other sources. Another well-known benefit of protein powder is it helps promote muscle growth in the body, which is why it’s so popular among body builders. However, everyone needs healthy muscle mass throughout their life, with the mass declining as we age. When muscle mass decreases it’s often replaced with fat, while our overall strength and balance decline with it. Therefore, supplementing a diet with protein powder is a great way to reduce the loss of muscle mass and encourage muscle growth. This is due to the amino acid leucine present in protein powder, which promotes muscle growth in the body. 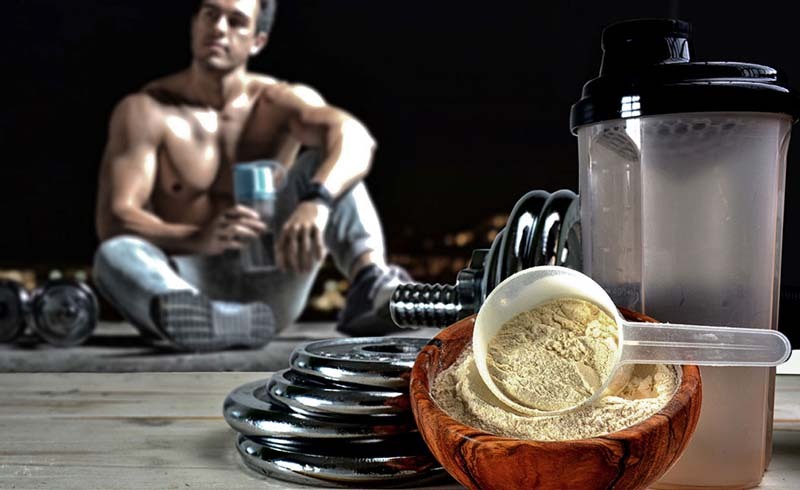 When consumed before or after a workout, protein powder appears to increase the efficiency of muscle growth, with most viewing a post-workout protein shake as the best time to consume for maximum muscle gain. Of course, losing muscle mass isn’t the only reason to use protein builder to build muscle. Some people want to improve their strength and the look of their body by increasing their muscle mass, which protein powder can assist with when incorporated into a weight training regime. Whey protein is regarded as the most efficient protein powder for building and maintaining muscle mass. Struggling to lose weight? Then protein powder could be the perfect addition to your diet to help with weight loss and management. As shown in the infographic from fitness equipment, consuming protein helps to satiate your appetite, meaning you feel fuller for longer on the same number of calories. As a result, people that use protein powder when trying to lose weight may find it easier to control portion size and curb snacking to reduce calorie intake, which are often the most challenging aspects of going on a diet. Whether you want to maintain a healthy weight or reduce your weight to something healthier, whey protein can help provide nutrition you need while avoiding overeating. Again, whey protein is the most effective in this regard, making people feel fuller for longer compared to soy and casein powders. Whey protein helps to promote gut health through good bacteria, helping to reduce or even prevent the negative effects of certain digestive issues. For instance, whey protein powder contains the protein lactoferrin, which promotes iron in the gut to prevent anaemia. Another study as indicated that whey powder may also reduce the negative effects of inflammatory bowel disease. While more studies are needed, the evidence suggests that an increased intake of whey protein helps reduce the negative effects associated with the disease that inflames the digestive tract lining. Antioxidants help the body fight against oxidisation and various diseases that attack the body as a result of this process. While the body produces glutathione, a vital antioxidant naturally produced in the body, its production is affected by the amino acid intake through diet. For instance, cysteine is needed to produce glutathione but we don’t always gain this through diet. Whey protein contains high amounts of this amino acid, meaning consuming a protein shake can possibly increase antioxidants in the body that help fight of diseases and maintain good health throughout life. Studies have indicated that whey protein lowers oxidation in the body while naturally increasing glutathione levels. A study has indicated that regular intake of whey protein could help reduce LDL cholesterol, one of the main factors towards developing heart disease. For example, a study of 70 overweight men and women showed taking whey protein showed a reduction in LDL over the course of 12 weeks compared to those taking casein protein. However, there has only been a single study that indicates the decrease in LDL cholesterol through regular whey protein intake, so further research is needed to provide more concrete evidence.